Organizers of Oakland's popular First Fridays street festival said they were cancelling the next event, scheduled for Nov. 2, because of a nearby shootout this month that injured five people. In a post on the event website, organizers noted that while the shooting happened several blocks away and three hours after the conclusion of October's event, it still sparked the need to review security measures. "Safety is something we take very, very seriously," the message said. 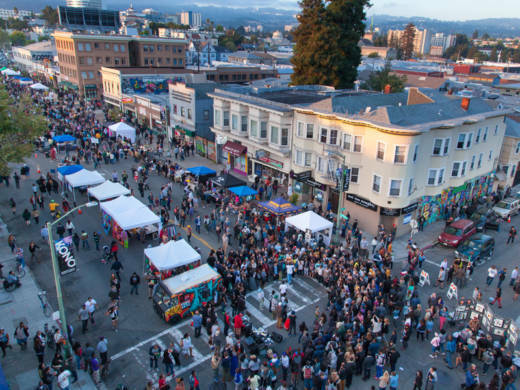 Organized by the Koreatown Northgate, or KONO, First Fridays started in 2005 as a small, unofficial street festival in Oakland's Uptown arts district, but has since grown exponentially and now attracts upwards of 30,000 people. "We’re proud of our track record managing a peaceful, popular and growing celebration," organizers said. "But with success comes new challenges." The group said they expect the monthly street festival to resume after "conducting a top-to-bottom review of our policies and procedures." "I was a bit disappointed in the stakeholders’ decision, but I respect and understand the steps that they are taking to ensure that it will continue to be a vibrant and safe activity here in the district," said Oakland City Councilwoman Lynette Gibson McElhaney, who represents the district where the event takes place. This is not the first time violence has broken out at the event. In February 2013, 18-year-old Kiante Campbell was killed in a shootout, and three others were injured.